The Pressure Point Band is Portland's most versatile dance band for corporate events and weddings. The Pressure Point Band features an impressive lineup of many of the area's top musicians and singers as well as a repertoire spanning over six decades. The Pressure Point Band is the premier variety band in the Portland, Oregon area. Its repertoire is unmatched in terms of versatility and polish. The Pressure Point Band covers music spanning six decades, satisfying musical tastes from nearly all age groups. Exceptions might be Dixieland, Rap or Heavy Metal. Well, no one is perfect. With The Pressure Point Band you get the experience of talented veteran performers who combine professionalism, enthusiasm and a high level of competence to create an atmosphere of fun and excitement that will make your function an event to remember. We were absolutely thrilled with Pressure Point – you guys are the best and will certainly be our first recommendation for our guests! I particularly loved the way the transition from “Landslide” to “love Shack” came off for my father/bride dance – it was brilliant, and did just what I wanted it to do – fill the dance floor in about 15 seconds! A really appreciate it Mike and please send our best to the rest of the band members – could not have been better. The lineup for Pressure Point is filled with some of Portland`s finest musicians and singers. Here is a little background on each band member. Matt's great keyboard playing along with his overall musicality, provides the crowning touch that helps make Pressure Point the most sought after "variety" band in the Portland area. Matthew performed with another well known Portland "variety" band, Night Flight for nearly ten years as well as being in demand for solo piano and Jazz work. Matthew is also the musical director for his church. The ubiquitous Dan Schauffler has played with so many well known local acts you would think he must be a clone. The Crazy Eights, Nu Shooze, Cal Scott, Lily Wilde, Gino Vanelli, and Johnny Limbo are but a few of the bands that have benefited from Dan's great playing. Dan also possesses a spontaneous sense of humor that helps to keep things upbeat and fun. From funk and soul with Jazz studies at Mt Hood Community College, Kelly has been a member of many of the top cover/dance bands in the area including Soul Vaccination, Five Guys Named Moe, rock and roll with Johnny Limbo and the Lugnuts and now with Pressure Point! Kelly has also recorded and toured internationally with The Paul Delay Band, Lloyd Jones Struggle, Duffy Bishop and many more. With Kelly Dunn providing the beat, you will be dancing and feeling good! It might be easier to describe what Chuck hasn't done than to list his credentials. Chuck has played with several of the area's favorite bands such as Design, Freeway and Two Much. Chuck is a first call guitarist for session work and when other bands need a sub. Chuck is one of the most versatile players anywhere, His style ranges from subtle acoustic, classical to nail you to the wall rock n' roll. Chuck spent two years performing in Hawaii and has toured the mainland with various club bands. He is a powerful singer with a wide range of expression. The consummate professional. Michael, the founder of Pressure Point is a solid bass player and exceptional singer. A strong front person with an engaging personality, Michael is a master at setting the pace for Pressure Point to create the desired party atmosphere. He has done commercial work and has worked extensively as a DJ and emcee. A very versatile performer! An extraordinary vocalist, Jennifer Lyn counts as influences, Aretha Franklin, Billie Holiday, Ella Fitzgerald, Jennifer Holliday, Etta James and Crystal Lewis among others. Over the past 10 years Jennifer has performed with many local bands as well as being in demand for studio work as a lead and background vocalist. Jenn possesses a pure, soulful voice and a warm, charismatic stage presence that audiences really respond to. Lynn is a multi talented performer as a vocalist, horn player and dancer. Presently gives private dance instruction at her studio in SE Portland and with her husband hosts a popular Tuesday Night Salsa class at Vie de Boheme in SE Portland. *The band is also available as a Quintet. The Pressure Point Band has carefully crafted a song list that encompasses the most popular dance hits spanning over six decades. Please enjoy the sound samples below and take a look at the current edition of the Pressure Point Band song list. Below are some videos of the Pressure Point Band live in action at a the Memorial Coliseum in Portland, Oregon. The performance was for the Cascade AIDS Project fund raiser in 2013, which featured the Pressure Point Band after an opening performance by Taylor Dane. Please visit the music section to see an expanded music list and hear additional studio audio samples. Pressure Point Band performing "Let's Get It On"
Pressure Point Band performing "I Will Survive"
Pressure Point Band performing "Bad Girls"
Pressure Point Band performing "Mustang Sally"
Pressure Point Band performing "Livin' On A Prayer"
Pressure Point Band performing "Let's Stay Together"
Pressure Point Band performing "Shout"
Pressure Point's client list reads like a who's who of the Northwest's movers and shakers. Many of the major fund raising organizations such as Waverly Children's Home, Doernbecher Children's Hospital, Portland Junior League, the American Cancer Society and the Assistance League of Portland have benefited from Pressure Point's amazing musical versatility. Many of our clients could afford any band you can name, they choose Pressure Point, that means something. Pressure Point is on the preferred list at many of the area's top private clubs such as Oswego Lake Country Club, Portland Golf, Waverley Country Club, Multnomah Athletic Club, Tualatin Country Club, Oregon Golf Club, The University Club, Hilton Hotels, Marriott Hotels, Doubletree Inns, Governor Hotel, and The Town Club. Many of our corporate clients hire Pressure Point again and again for their recurring events. Among them are Mentor Graphics, Kaiser Permanente, OHSU, Solo Flex, Nike, Spirit of Portland, University of Portland, Willamette University, Mercedes Benz Corp., Columbia Forest Products, International Forest Products, Willamette Valley Country Club, Orepak and Anderson Construction. Aside from the many corporate events and fund raisers that Pressure Point performs for, the band has the distinction of being one of the first bands considered for higher end weddings in the Portland area, central Oregon as well as the Seattle area. Pressure Point has traveled twice in the last two years to Sun Valley, Idaho to perform at a couple of incredible weddings. The band has made over twenty trips to Seattle and Central Oregon in the past year and a half. The word is getting out, "When the music matters, and only the best will do." "Pressure Point is the clear choice for your next event". Thank you so so so much!! I have been meaning to message as you as soon as I woke up from my two day long sleep recovery!! You guys were seriously amazing!! The dance floor was packed from beginning to end and we got so many compliments on you guys. Several people have already asked me for your information. We can't thank you enough! Feel free to use us as a reference. Great band! Our guests had a fantastic time at our wedding and couldn't stop talking about Pressure Point. They were one of the big highlights of the day, and we wish we could have danced for hours more. They learned two new songs for us and were quick to respond to any questions and concerns before the day. We would definitely recommend them to anyone who wants a fun and upbeat atmosphere at their event. Thank you so much! You guys were absolutely amazing and everything we had hoped for. Huge hit with our guests. I'll be sure to leave a positive review. Thanks again and we look forward to hearing you play in the future. We loved Pressure Point at our Zenith Vineyard wedding the other weekend! They did an awesome job keeping the guests on the dance floor all night. We had them learn a song that wasn't on their list for our first dance (Pretty Girl - Eric Clapton) and they absolutely nailed it. Their guitarist played acoustic for our ceremony and it was perfect! You and the band did SUCH an amazing job. We had heard good things, but were blown away by hearing you all live. Everyone is talking about the band. Thank you for everything - your flexibility, accommodating last minute requests, and your incredible enthusiasm. I plan to send you a note with my thoughts more spelled out, but please let me know where I can submit a review or if I can offer testimonial for you all. Simply amazing. I apologize it has taken me so long to write you- life has been crazy! But i want to tell you thank you so much for being so amazing at our wedding and keeping the party going all night! Pressure Point made that party and you all sounded fabulous! We are so thrilled that we booked with you and cannot thank you enough! Also great job to keeping that dance with my Mom and bridesmaids a secret- everyone is still talking about how you all came in live at the end! Everyone had a great time and couldn't stop talking about how great you guys were. You got everyone dancing and that's all we can ask! Thanks again, we will recommend you to anyone who needs a band! Pressure Point Band was one of the easiest things about wedding planning. They know what a wedding entails, understand the needs and timelines, and are 100% there to make the day go as smoothly as possible. We used them for ceremony music, cocktail hour, and dinner music as well as the main reception band time. It was truly one stop shopping to get the benefit of all their incredible musicians for all of our wedding days needs, plus they bring their own sound and lighting, reducing another possible headache. So, in terms of the practical elements, this band rocks before you even hear them play. But then you add in that they are this hugely talented, diverse, and fun band and they are the complete band package! They learned the songs we wanted for the ceremony processional and first dance and did awesome jobs on all (they nailed my request for an instrumental version of Katy Perry "Firework" to walk down the aisle to). The rest of the night they played what worked with the vibe and time and kept the mood right, just great crowd pleaser favorites! They had kids and grandparents dancing and saying how great the band was. All in all a really great addition to the day and I'm so happy they were part of it. Thanks Pressure Point! Thank you so much! We absolutely loved all the music you played and our guests all had a fabulous time. We so appreciated everything you did to make it special! Tell the whole band thanks from us! Working with Mike and Pressure Point was a positive experience from start to finish. The most important component is obviously the music: these guys are incredible! We were the first of our friends to get married, and after the reception everyone said how they had to have a live band at their wedding because of how great our music was. To those of you wondering if their acoustics are as good outdoors as indoors, fear not, we had our wedding outdoors at a Winery and the sound still rocked! We opted to have not only the full band at our reception, but for a modest additional fee keyboard for the ceremony and classical guitar/flute for cocktail hour after the ceremony - both highly recommended. Mike was incredibly responsive to email - important for us as we were arranging the wedding from out of state. He was able to procur some wonderful lights for our outdoor dance floor on request, and also set up a great audio system for our ceremony, best man/maid of honor toasts, etc. When we accidentally left the final check at home in California, Mike was cool about us mailing it to him after the ceremony (much cooler than I would have been!). I guess the best way to sum up our experience is to repeat what our photographer wrote on her web site: "They had the best live wedding band we have ever heard!" Thanks again to Mike and Pressure Point for making our Wedding such a special and memorable day! Everything was perfect! Everyone asked where you were from and how we found you and wanted to know the band's name. You guys sounded fantastic and definitely made our reception the party it was. Thanks so much for working with us and for letting us sit in! Hope to run into each other again in the future! Thank you so much, Mike! Our guests came up to us many times during and after our reception to say how much they loved the band, so high fives - you all were a HUGE hit! Thanks again for helping make our reception memorable and fun -- it was great working with you! A huge heart-felt thank you to each and every one of you for the joy you and your fabulous music brought to my 50th birthday party at The Dye House! I can’t imagine anything better than dancing out of your 40’s and into your 50’s with dear friends and family and enjoying such great music! Even the line dancing during your breaks kept smiles on everyone’s faces and a groove in their step. EVERYONE is still talking about how much fun they had that evening and how much they enjoyed Pressure Point. You all ROCK! Thank you! There were universal and overwhelming raves about the band. There is no question you guys made it a great evening. Your help and professionalism from start to finish was truly outstanding. Please give our sincerest thanks to the entire group - hope to work with you again in the future! Thank you! We had a wonderful time and received many compliments on your music. You got everyone on the dance floor which is exactly what we were hoping for. We will definitely be recommending your band to our friends and family in the future. Thank you so much for making our wedding at McMenamin's Edgefield such a great time! We were very impressed with your knowledge of the venue and with the variety of music Pressure Point is able to play. We received so many complements on the band's performance and you made the whole process remarkably easy on us, which cannot be underestimated during the days leading up to a wedding. The band played our ceremony music as well as the reception, which made Pressure Point a one stop shop for all our music needs. I'll not soon forget all the crowd pleasing sing-alongs we had and my surprise when you welcomed my college roommate to the stage to sing with you! Pressure Point's professionalism and years of experience showed through with the high quality entertainment and advice provided. Thank you again for making our wedding a memorable success! These guys ROCK! Pressure Point is an incredible band. We told them we were a lively bunch and we asked the band to play accordingly. They delivered! They even had Grandma and babies dancing until the final call. They can play nearly anything and do an amazing job blending one song into the next. We also had their guitarist do our ceremony and cocktail hour music and he was great! Highly recommend them. They are worth every penny and more! I’m writing you all an inexcusably late note to say thanks so much for playing at my and Hannah's wedding Memorial Day weekend last year out by Mt. Hood. Chuck, we loved the ceremony and cocktail hour music, and to all of you, you guys are awesome. Everyone loved you – a friend of mine brought you up ~2 months ago unprompted as the best event band he’s ever seen, and given that he went to college in the Midwest, let’s just say that he’s been to a lot of weddings. When I look back at the photos of from when you guys were on, I can’t find a single one that doesn’t make me think “that was a total blast.” Personally, I wanted to say how much I enjoyed your playing - you guys are super tight and fit so well together as an ensemble. I thought you sounded fantastic. Also, thanks so much for letting me play a song with you. It was an unexpected privilege, and I hope was able to be more than a groom you had to gut through a song with. I had a blast – I still remember when I realized when you guys wanted me to trade with Dan on sax and thought to myself, “well, there’s a first time for everything.” More importantly to me, though, my parents really enjoyed it. I basically never play for anyone – it’s just something I do for me – and it was the first time my parents had seen and heard me play in nearly 10 years, and the first time they've ever seen me play with a band. My Dad in particular says that getting to watch me play with you all was his favorite moment of the whole day, and he still talks about it. So thanks so much for not just being a fantastic group of musicians, but for making my Dad’s day in the most unexpected way. P.S. Our photographer passed my name on to Portland Bride & Groom and I ended up getting interviewed for the Summer/Fall issue that’s out right now. I endorsed you in the interview – hope that helps (not that you need the help, you’re playing speaks for itself). Thank you for sharing your time and talent with us at our daughter’s wedding on May 25th! You proved to be the highlight of the reception! You also helped us to relax as your music erased our stress over problems with the meal and catering nightmare! Thank you Mike and fellow musicians for the beautiful music that you brought to the ceremony. You helped to make the day special. Our guests and we continue to cheer for you and we thank you! Mike—a million thanks for making the trip Friday and another stellar performance! We are getting RAVE reviews and requests already to have you back next year—so THANK YOU and GREAT JOB! I hope you all had fun and will consider it again next year—first Friday in March 2013—mark your calendar now! You guys are always such a delight to work with—you always make us look good….especially this time around when we’d been trying to sell this client on you for two years! It’s a great “I told you so” for us and big win for them! Thanks again so much and we will see you soon! Thank you so so SO much for your fabulous performance at our wedding. Both Jamie and I felt like the wedding was absolutely perfect and you guys played a huge part in that. I have never been to a wedding where the dance floor was full from start to finish, or where guests were having so much fun that the band actually extended their time. In fact, at around 10 I asked Molli when the shuttles were getting there and she replied "they're already here but no one wants to leave." I didn't get to do much dancing because I was so busy making the rounds but every time I made it to the dance floor the music was fun and people were having a great time. Again, we can't thank you enough for making our wedding so fun. If you EVER need a satisfied client as a reference please don't hesitate to let me know. PS Just as a funny side note, my parents went over to our neighbor's house on Sunday morning to thank them for putting up with our noise. They said they'd had a great time sitting on their back porch listening to you guys and they asked who our band was. It turns out you played their wedding about 10 years ago. We are so thankful that we found for our wedding at Youngberg Hill! Our guests are still raving about all the fun they had and you were part of that. We loved working with you! Thanks for learning our songs and making our event to always remember! I am on the board of a non-profit organization in Seattle that wanted to make its 40th anniversary fund raiser a resounding financial success and a way to reward its supporters. The board chose Pressure Point because the musicians provide music that appeal to everyone from their teens to their 80s. It’s an age diversity that is tough to please but the dance floor was full from the first number played to the last. When a fund raising evening ends with a lot of fun, it’s a good way to maintain or increase attendance for next year’s event. Also, for those organizations that would like to provide their supporters with entertainment that is cost effective along with high quality first class musicianship, Pressure Point is a must. Comments were made concerning other functions that people have attended where the entertainment was 2 to 3 times the amount but the dance floor remained barren. At our event, people wanted to stay and enjoy Pressure Point’s music. Heading to the check-out desk was not a high priority for the attendees. If you want people to leave your function with a lot of exhausted, satisfied and happy donors looking forward to next year, Pressure Point will fill that need. As you know, we have retained the services of Pressure Point Band for that past four years for our Annual Sweetheart Ball during the month of February at the Governor Hotel. This has proven to be a positive experience. Our membership has given us great feedback each year with regard to the band. We are so committed to securing your band each year, that it is the first call that my assistant makes every business day after the ball each year in order to execute a contract for the upcoming year. It has also been a pleasure to work with you over the years, knowing that you are ready and willing to provide the best possible music for our event. Pressure Point appeals to all ages. The people in attendance to our ball range in age from early 20’s to early 90’s. All have been positive in these comments. You have been part of the success of our Annual Sweetheart Ball and we feel very fortunate that we have found a band that we know will contribute to that success each year. If you find that you are asked for a recommendation other than written, we would be happy to speak to anyone who requests that. I can assure you that our guests, and the 2 of us, had a truly great time at the reception thanks to you and your fabulous band. Thank you, all, for making our reception rock! One quote that keeps coming to my mind, from a guest, is, "I've been to A LOT of weddings and that is the BEST wedding band I've ever heard." If anyone asks for a band recommendation I will most certainly be sending them your way. In fact, I've already started thinking about how/when to host another party and include you! Our Event was a great success, thanks so much. The band, and pre-dinner music added immensely to the evening—more elegant, more exciting, more energy = more fun! I don’t think we’ve ever had a program that moved along so briskly either—maybe a little too briskly (! ), but the attendees were happy. The deejay’s later in Alexander’s were also really good. I’m so glad we did that as it really kept folks around and many of us obviously needed to blow off a little conference steam and dance! Thanks again Mike. You and your fellow musicians really made a difference in the quality of this event and I appreciate how flexible you’ve been to work with. I wanted to take a quick minute to express our gratitude for a job well done! Pressure Point was a great addition to the 2010 Heart Ball. 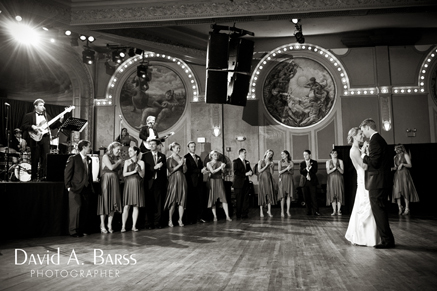 Our guests enjoyed the energy and sound of your group and you "packed the dance floor!" I know people thought it was great and you interacted with the crowd so well! We’re so thankful for your help in ending a successful evening with a bang! We will certainly be in touch when the Heart Ball comes around again next year! Wow! You guys are amazing! Thank you so much for such a wonderful performance at our wedding! We loved every minute of your music. Thank you so much for learning "You Are The Best Thing", it was perfect. All of our friends and family are still talking about how fun the band was. We can’t thank you enough for making our wedding so special and memorable. Thank you, thank you, for your excellent service. We simply could not have asked for more from you and the band members. You are all so talented! The music was fantastic, you worked so hard, and you made it so fun and memorable. I don't think that we'll be having any more weddings in Portland. However, should any prospective client request a reference...you know who to contact! THANK YOU for a wonderful night! Everyone I've talked to said the band was the best they've heard, and Brett and I could not be happier. If you ever feel like doing gigs in DC, let us know! Otherwise, I will recommend you to any Seattle bride. Absolutely perfect! Just wanted to send a BIG thank you for helping make Saturday night so perfect. The string quartet was quite talented... and I cannot rave enough about your band! You guys blew us away! You really MADE the party! Please use us a reference! Thanks again for making our wedding night so memorable. You guys were awesome! Our guests had a blast and almost everyone complimented us on the band. Hope we didn't get too rowdy for you guys at the end of night! Good luck with everything in the future! Please let us know if there's anything we can ever do for you. Tera and I would be happy to provide a reference or testimonial if you ever need one. Thank you for such an unbelievable performance! We had a blast -- could you tell? Honestly, I heard from Kerry how good you guys were but I did not expect you to be THAT good. I got so many raves from my friends. It really means a lot to us that they had such a blast dancing at the wedding because most of them traveled from the east coast to be there. You guys really looked like you were having fun performing, which just electrified the place. Also, thanks so much for quickly learning Amado Mio. It sounded terrific. We would be more than happy to recommend you to others or write a testimonial for your website. Just let us know. All the best to you and the other band members! If you ever come out to D.C. or New York to perform, please let us know. We'd love to catch the show (if it's not private) and take you guys out for drinks. Absolutely the BEST wedding band ever! Gave us much more than we paid for, were super fun & friendly, got everyone dancing right after the cake was cut! Very eager to please, even learned new songs for us, willing to do anything we wanted or needed very quickly. Much more reasonably priced than the Seattle bands that we considered. The guests practically rioted when they stopped playing! (They had to play for an extra 2 hours!) My husband and I both agreed that hiring Pressure Point was the best-spent money of the whole wedding. I CANNOT say enough good things about this band! They are so talented and entertaining - and not corny at all (like many other wedding singers we looked at). They took my wedding to a whole new level that I had never anticipated. They had everyone on the dance floor during the FIRST SONG! They ended-up staying for 2 hours longer because the dance floor was still packed at the end of the night. They even learned a new song for our wedding! Their price included traveling from Portland, and was still priced less than the Seattle wedding bands we looked at using! We had the BEST time at our wedding, as did our guests. Thank you for filling the dance floor and helping to create such a wonderful event! Thanks so much for working with Sam and I. It was so great to have you at our wedding, and our guests can't stop raving about how awesome your band really was. You truly made our reception a success!! Thanks again, you are truly a class act, and I would love to recommend you to everyone we know!! We just wanted to thank you again for a fabulous evening of great music and fun at our daughter Lisa's wedding at Sunriver last Sunday. I can't tell you how many people commented on what a wonderful band and how much fun they had dancing! I know several people asked you for your business card and I hope you are able to book more "gigs". I know that Chris and Neil Swanson wanted to see if they could book Pressure Point for an upcoming OHSU function. Please thank the entire band on our behalf. You made our daughter's wedding a big success!!! If you ever need a recommendation, please don't hesitate to ask! We're just coming down off that "high" of Lindsey and Ajah's wedding last Saturday, and I wanted to be sure to communicate with you how thrilled we all were with your music for their reception. The Salvidore Molly's guy, Adam, said that he'd never seen a band get so many people on to the dance floor, and so quick. You guys (and girls) are so talented and versatile, and the music selections were just perfect. Thanks again, Michael, for making this such a special -- and successful – event! We'd recommend you all to anyone! And look forward to seeing all of you in some venue sometime soon. Way to go!! Thank you so very much for doing such an amazing job at our wedding! You were so much fun and everyone could not stop talking about you. Best of luck in all you do, thank you again! Thanks Mike, for everything! We had a great time at the wedding and Pressure Point was fabulous -- all of our guests have been telling us how much they loved the band and that the music really contributed to the overall event. Thank you for a fabulous event last weekend for the Buckner/Hobbs Wedding. What a pleasure it is to work with you and your band. Pressure Point is very talented. You really kept the dance floor packed! Mike, we always appreciate your enthusiasm and professionalism. Thank you for making the wedding a success. We look forward to working with you in the future. Thank you so much for making our celebration an event to remember! Thank you so much for an incredible evening. Jen & Ryan's wedding was truly a success because of all of you. I repeatedly received the comments through the night that you were by far the best band people had ever heard at a wedding. Matt and I would like to thank you and the Pressure Point band for an amazing performance at our wedding reception on June 14th! You were truly incredible! So many of our family and friends commented on the energy and talent that your group had; and we could not have been more pleased. The music and dancing made it the most fun night of our lives! Mike, you were a pleasure to work with, and we would be more than happy to provide raving testimonials to any of your potential clients! Thank you from the bottom of our hearts! Thank you so much for playing at our wedding on May 29th, you guys definitely made the party a huge success! Also, learning Brenden's song was a great surprise! Thanks very much for everything - you guys were great! And our guests were raving about you guys as well! Everyone was dancing right up until the end and that made us very happy. We absolutely loved your group... Pressure Point was the hit of the evening! When we first saw the schematic of the tent we thought maybe the dance floor was too big! I am sure you noticed that every inch of it was covered with all age groups rocking out.... young and old loved the music. I do believe not one person out of the 205 guests didn't dance. That is amazing! Your group is very talented not just in their technical qualities (many guests were musicians themselves and had very favorable comments) but you have a gift of knowing what were the perfect arrangements and songs to get everyone out there dancing. It was an exciting, uplifting and wonderfully fun time. The music was very important to us, we wanted good music. Your music was more than top shelf, it was excellent!!! Also, Mike I would like to personally compliment you on your skill as a leader. You very masterfully dealt with the crowd. It was perfect!!!! Guests are still raving about "the band". Thank you and your group for making our only daughter's wedding a fabulous night to remember. I am a wedding and event coordinator and have been working in Central Oregon for 16 years. Over the years I've had the opportunity to work with many bands at various venues. Without a doubt the consistently favorite band is PRESSURE POINT, which I source through Celebration Music and Events. The band is thoroughly professional and reliable which makes my job that much easier! The guests absolutely love dancing to them and they always get the crowd out there having a great time! It's always a joy hearing from my clients after the event with all their positive feedback. From my standpoint they are top tier and always make a party a blast! We really enjoyed the band as it really complemented and completed our overall wedding. You guys were fabulous. We just wish the wedding timing went more smoothly so we could have heard even more of you. It's always a good sign when people are still dancing through the last song. We also loved your rendition of our first dance. Hope it's something you can add to your repertoire! Anyway, all the best and stay tuned for referrals from us. Many thanks for the great music performed at our wedding! We were so happy that many of our guests danced, and danced, and danced! Your performance of Come Rain, Come Shine was great and will provide memories for years to come. Thank you and we will be happy to recommend Pressure Point for additional events. Pressure Point Band pricing is based on the details of each individual event. Factors affecting price include performance date(s), hours, the package and options selected, travel considerations, etc. We cannot give an exact price quote without considering all details, however, we can give you a very good estimate of what our services might cost for your event. Please choose the area that your event will be held and enter your basic event information to obtian an instant price quote. If you do not see your area listed, then please choose Portland and just know the quote does not include the cost of travel. *All quotes are estimates and neither the Pressure Point Band nor the customer are required to book these services at the prices quoted. Also, no dates can be held without a signed contract and deposit, unless otherwise specified by the Pressure Point Band. Use the form below to request more information, a schedule check, price quote etc.